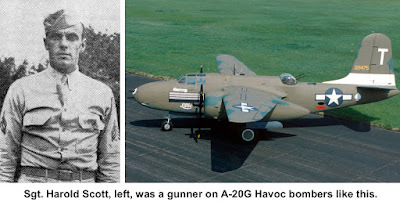 Harold Scott was one of several Ridgefielders who went off to fight in World War II and never returned home. Born in 1919, son of a local automobile mechanic, Harold Walter Scott grew up on Bailey Avenue. He was a member of the Class of 1938 at Ridgefield High School. After finishing school, Scott began working for the New York Central Railway but soon decided to enlist in the Army. He did so in March 1941, 10 months before Pearl Harbor. Scott spent 18 months in the coastal artillery in Alaska, but apparently wanted to see more action. He switched to the Army Air Force where he became a gunner on a bomber. Scott was with the 417th Bomb Group, which flew Douglas A-20G light bombers, a two-engine craft that required only a pilot and a rear gunner. On March 23, 1945, his plane, piloted by Flight Officer Samuel Harmell, was on a mission in the Philippines when it was hit over Cebu. 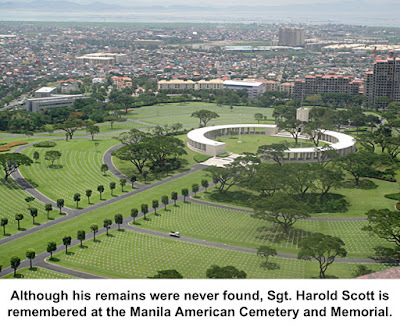 An Army report written March 26, 1945, said Scott’s plane “while attacking a target at Cebu City was apparently hit by anti-aircraft fire in the left outboard fuel tank. Flight Officer Harmell ordered his gunner to bail out and Sgt. Scott was seen to leave the aircraft at very low altitude, his parachute opening and breaking his fall. The gunner landed approximately two miles west of Cebu City. The aircraft was seen to clear the land and crash in the water approximately two and one half miles southwest of Cebu City. Harold Scott, who was 25 years old, was never found. American Cemetery and Memorial at Fort Bonifacio, outside, Manila. The cemetery there contains the graves of 17,202 fallen soldiers. In 1952, his classmates placed a plaque in his honor in the downstairs hall of the old Ridgefield High School.